Hot of the heels of its two Golden Globe Wins (Best Motion Picture – Drama and Best Actor- Rami Malek), Queen have released a new video teaser that puts part of the band’s Live Aid set next to the re-creation of it in Bohemian Rhapsody. 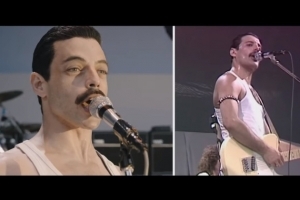 The clip on youtube shows part of “We Will Rock You” so you can compare the shots from the TV broadcast from 1985 to what angles were used in the film. Watch it on YouTube now. The entire re-creation of the Live Aid performance will be on the home release of the film, which is out digitally on January 22nd and on Blu-ray and DVD February 22nd.